In a sign of just how strapped the Texas Panhandle and South Plains are for water supplies, water systems in the region last week started drawing from a once-empty lake that is now just over 4 percent full. 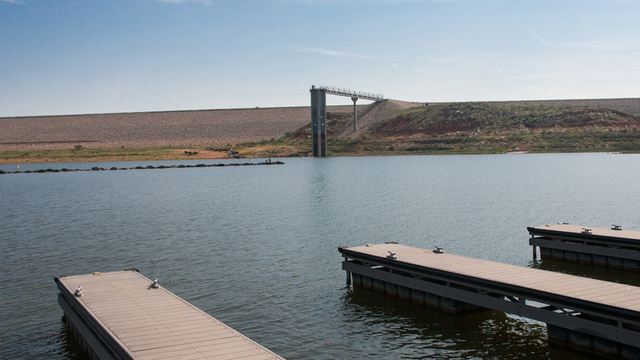 The Canadian River Municipal Water Authority, which supplies about half a million people in Lubbock, Amarillo and surrounding towns, began pumping from Lake Meredith for the first time since the summer of 2011. Unusually heavy rains in the past month have given the lake close to 2.8 billion gallons of water. Last year, the water authority provided its customers more than six times that amount from the Ogallala Aquifer, which is losing more water than it is gaining. Only a little over 10 years ago, Lake Meredith was the area’s exclusive water source. Not everyone is prepared to drink from Lake Meredith; a few of the smaller towns have said they would not use the lake water. Because it is so low, Lake Meredith is more affected by sediment and has high levels of dissolved solids like salts, which does not impact human health but can affect the water’s taste and could trigger extra treatment costs. The authority plans to blend a portion of lake water with Ogallala water, which is remarkably clean, so water quality should not be an issue, officials say. Still, given that nearly all the reservoirs in the historically dry western portion of Texas — most of which were built after the historic 1950s drought — are dangerously low, it’s unlikely that Lake Meredith will be any more of a sustainable supply than the Ogallala. The amount of water that planners will be able to depend on from Meredith “is going down every year,” said Bill Mullican, a former water supply planner for Texas and the Lubbock area. That means growing cities like Lubbock will be able to thrive as its university population continues to expand, but much of the rest of the region — still a major producer of cotton and corn — may go in a very different direction.